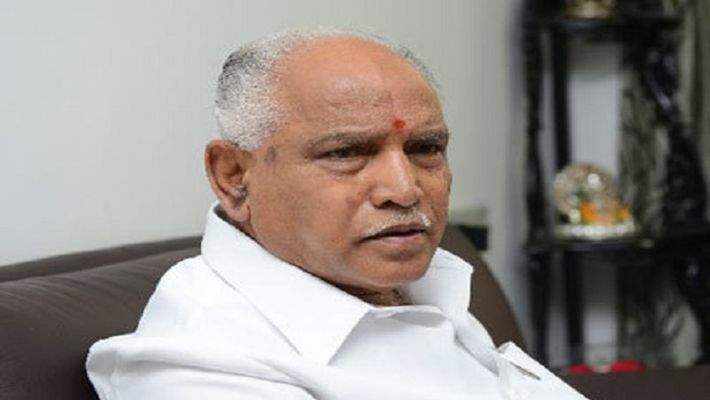 Bengaluru: Karnataka BJP president, BS Yeddyurappa admitted that the voice in the audio clip that Chief Minister HD Kumaraswamy released was his own but claimed that the audio was edited as per convenience. He also admitted to meeting Sharanagouda. Yeddyurappa spoke to media at Hubbali airport and said that the met JD(S) MLA Naganagouda's son Sharanagouda at the inspection bungalow in Devdurg. In his statement however, Yeddyurappa reiterated that he would step down as an MLA if HD Kumaraswamy's allegations were proved true. Yeddyurappa's has made alterations to earlier statements regarding the audio clip just a few days after he claimed that the audio was fake and the allegations of him meeting Sharanagouda was untrue. Nevertheless, despite the change in statements the BJP has filed a complaint against the Kumaraswamy for defamation. On Feb 8, Karnataka Chief Minister HD Kumaraswamy had released an audio recording of an alleged conversation between BS Yeddyurappa and Sharanagouda Kandkur just hours before his budget speech. In the alleged conversation, Yeddyurappa was heard trying to woo Sharanagouda with an offer of crores in cash and a ministerial berth. In his conversation, he is heard saying that the speaker of the Assembly has also been bought on order to accept resignations of the ruling party MLAs. Many prominent names such as Prime Minister Modi, Amit Shah and officials of the court were also mentioned in the alleged conversation. BS Yeddyurappa dismissed the allegations and called it a dramatization with voiceovers. Though the Karnataka BJP leader did not however mention the purpose of meeting Sharanagouda, there’s enough in this controversy to keep the ‘Operation Lotus’ theory afloat.